WW2 german binoculars 7x50 Zeiss. 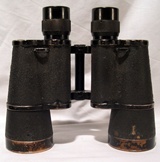 German binoculars 7x50 magnification in use to officers during WW2. Normally it was gave to members of special units such as reconnaissance and artillery observation. 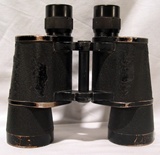 On the upper right plate of the bodies there are these inscription: "Dienstglass" meaning service binoculars; 7x50 the magnification; the serial number 2245864 which indicates that this binoculars is part of a batch of 2500 pieces produced after the June 1942; the code "BLC" corresponds to the manufacturer Carl Zeis, Militarabteilung, in Jena in the German region of Thuringia. The blue cross indicates that the lenses were treated to withstand temperatures up to -40°. The lenses are perfect and extremely bright. The reticle is present in the right lens. Very good conditions. Notify me of updates to WW2 german binoculars 7x50 Zeiss.